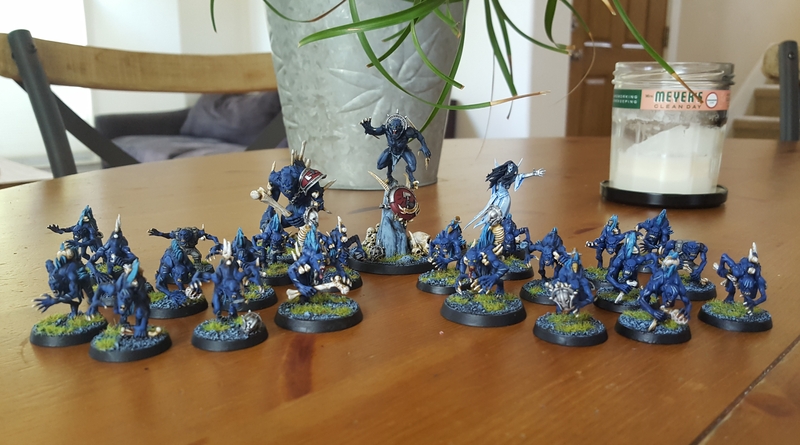 As mentioned in my other post regarding this army, I’ve had a connection to Warhammer ghouls going back to the days of Mordheim. Also, a ghoul heavy Blood Bowl roster is one I use to run with great success. With that, the Flesh Eater Courts army definitely drew my eye. That said, I don’t think I’d be excited to take them up to 2000pts. GW basically took two units (a box of crypt ghouls and box of crypt horrors) and stretched them out with enough heroes and units for their own Battletome. What you end up with though, on the modelling side, is little variety. Let’s take the above unit of Crypt Ghouls as an example. A box comes with 10 models. There is a ‘Crypt Ghast Courtier’ hero that you can build with this box. However, if you do that …you only have 9 ghouls left. 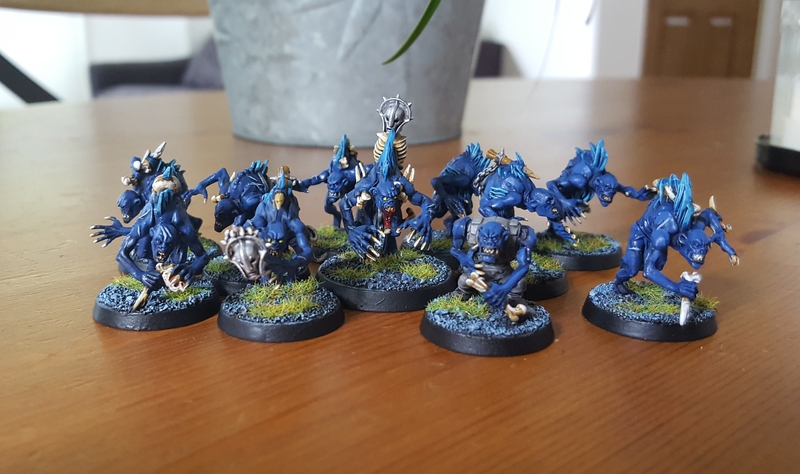 In Matched Play (GW’s term for the points based system) a unit of Crypt Ghouls has a 10 model minimum. So, with one box, you either field a full 10 with no hero…or you need another box. Now, there are also rules for undersized units, so one could run this in Matched Play at a handicap. Oh, in a unit of 10, there can also be a ‘Crypt Ghast’…not quite a full on hero, but a leader. So again, this is all just an example of really getting the most out of an existing set of plastic. In my case, I happen to have some extra goblin bits and danglies, so could convert a runt to place in the back of each unit when I do use a Crypt Ghast Courtier. To denote all these, I’ve sort of standardized features across the units. The Crypt Ghast Courtier is on 32mm (hero base) and has the skeleton strapped to its back. The Crypt Ghasts have a stormcast helmet somewhere on their model. The stand-in runts…well…they stick out easily being the only clothed ghouls as well as being undersized. For me, the models ended up painted a bit darker than I anticipated, but looking at their color scheme they sort of have a Fear of the Dark album cover vibe. The blues, the bone colors, the slight yellow…I can see it. 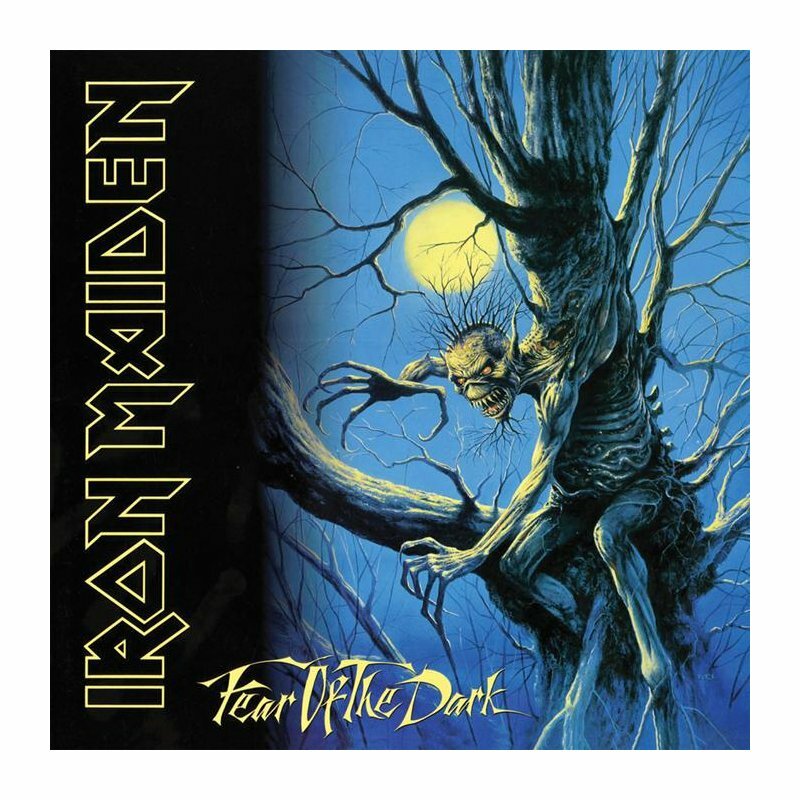 But then again I’m a big Maiden fan, so I’m sure this wasn’t totally accidental. Also, at this point in life, I’ve given up some painting concessions. With a wife and kids, career, other hobbies, and interests in multiple systems, I’m not painting for awards here. I shoot for what I call ‘80%’. The point where they may not hold up to deep scrutiny when held close, but at arms length, down on the table…look fantastic. I cut a few corners here and there such as eyes being omitted on non hero models. However, I hope strong (or decent) color scheme and theme make up for that and the army still looks good on the whole. I’m not a highly competitive player so am not overly focused on Matched Play, but I want to be sure my army is in compliance on the chance I play at local stores. Generally, I’m a big fan of the ‘roll your own’ flavor of Open Play and Narrative. With that, I’ve enjoyed painting these models with about 1000k points in mind. 2000pts doesn’t seem exciting because of that lack of unit options. It would just be doubling up the work I’ve already done. Eh. Also, in Open Play I get to use the Tomb Banshee as a hero in this army, The Silver Maiden of Chamon. In Matched Play (Per General Handbook 2017), Flesh Eater Courts don’t ally with the Tomb Banshee’s Nighthaunt faction so they (the FEC) would lose any specific FEC army abilities if they took her on. I might have to use her model as ‘Counts As’ for a Crypt Ghast Courtier or Necromancer or something. The Silver Maiden is one of the key inspirations behind my army, so she’ll be included in some fashion. 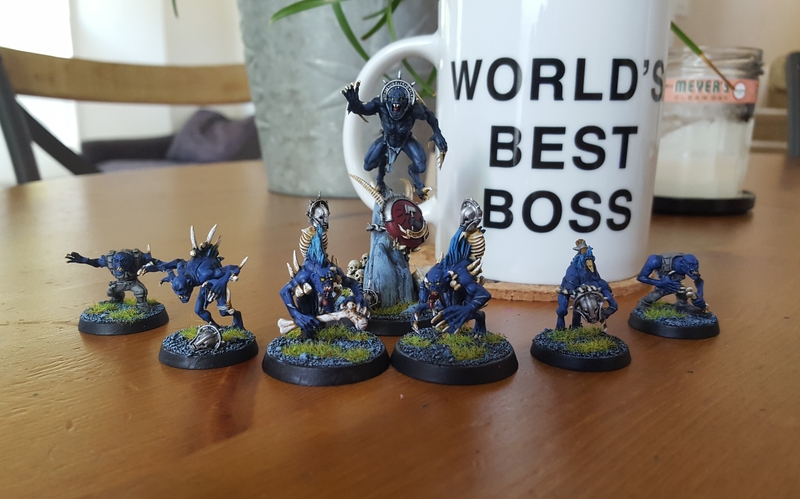 I’m looking forward to the new ‘Look Out, Sir!’ rule in the upcoming AoS 2 which will be good to represent the ghouls protecting their Maiden. This army is almost done. I’m one Varghulf and either the Zombie Dragon or Terrorghiest (haven’t decided which) from being completely finished. At some point, I plan on incorporating a unit of Crypt Flayers (winged Crypt Horrors) and a pack of Dire Wolves. Not to take this army to 2000K, but simply for a little variety at 1000K and in Open Play. In closing, here’s our ghoul characters with their Abhorrent Ghoul King, Lord Maulheart. 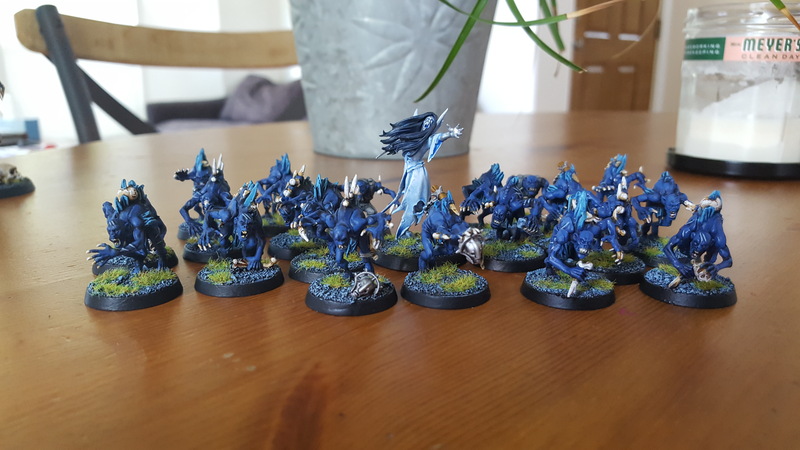 This entry was posted in Age of Sigmar and tagged Age of Sigmar, Flesh Eater Courts, Nighthaunt, wargames, Wargaming, Warhammer by Mr. White. Bookmark the permalink. Love it! You are correct that the FEC line is lacking in variety, but they’re still costly enough in points that you can hit 2K without that much effort. 3 Flayers and 6 Horrors and a Crypt Haunter Courtier add 600 points for 10 models. It’s certainly true FEC can do 2000k easily, but I feel they may lose a little something too. A terrorgheist makes a sweet showcase piece at 1000k. At 2000pts it may be one of 2 or 3…with each diluting the visual impact of each other. Less is more, I suppose. Conversely, a faction like Tzeentch can do a varied 1000pt list, then at 2000pt bring on something like a Lord of Change.